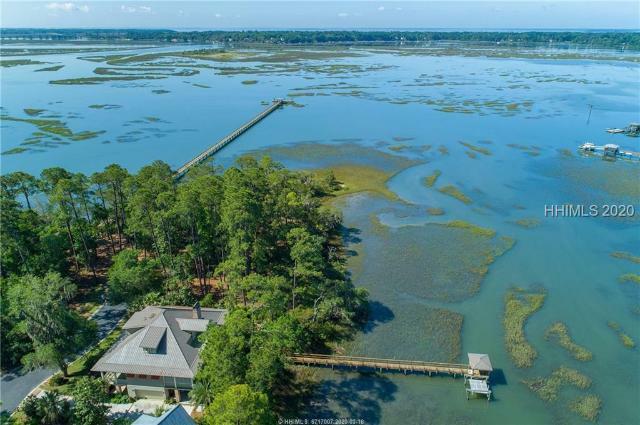 Located on the high bluff overlooking the waterway and the lights of downtown Beaufort, this stunning, new deepwater home was built to the highest standard in 2016. Comprised of approximately 6,698 square feet, the home offers four bedrooms, three full and two half baths. Constructed of cast stone and hard coat stucco, the home offers Anderson Impact windows and doors. There are two fireplaces, a large two car garage and a private deepwater dock. Exceptional craftsmanship is exhibited throughout the property. The front door opens to a grand foyer with a soaring ceiling, Botticino marble floors and a circular staircase. Immerse yourself in the expansive views overlooking the shoreline of Battery Creek, your Island Life awaits! This waterfront home enjoys a 180-degree sightline. You have unobstructed views of the Russell Bell Bridge from your second floor screen porch. Enjoy cooling breezes, on the double back porches, from the tidal marsh outside your door. 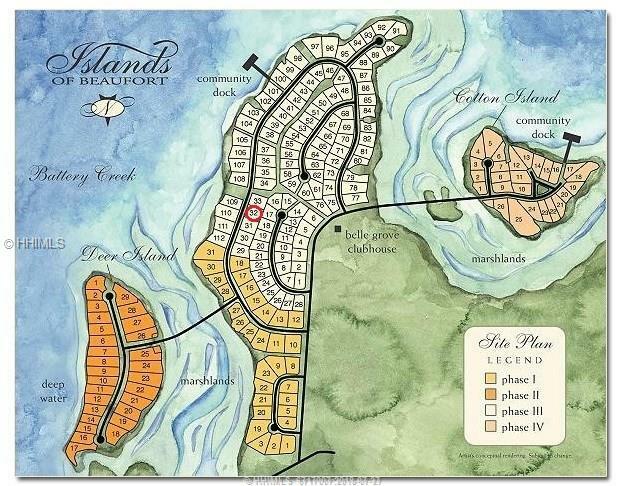 Located on Cotton Island in the beautiful Islands of Beaufort Community. A short distance to the clubhouse, tennis, pool, and community dock where you may launch a kayak, go crabbing, or enjoying the sunset . Reversed floor plan, to maximize the best views. Ideal location close to downtown Beaufort, Spanish Moss Trail, and the medical district. On the 1st floor of the 2-story home is an entry foyer. A great room with an open kitchen, family room w/ fireplace & dining room. On the 1st floor is the master bedroom w/ a full bath and a 1/2 bath for guests. On the 2nd are two nice size bedrooms and a full bath. Storage areas are plentiful. Beautiful hardwood floors on 1st floor. People naturally head to the front porch to swing. The screen porch stretching across the back of the house is a favorite for adults on a beautiful evening. There is a detached 2car garage. Enjoy a riverfront park nearby. Superior Custombuilt Four Bedroom Home in Desirable Battery Shores Community fully upgraded, and turnkey ready for your family. From the inviting curb appeal, 1015 Mustelidae boasts, to the gourmet kitchen, the ample sized rooms, the Craftsmen Style Architecture with high Energy Efficiency throughout this home offers it all and more. The home utilizes great use of space, flow of natural light, optimal storage, and beautiful floor coverings. There is also an oversized 2 car garage with deep sink and large Sprayfoamed Walk-In Attic. Centrally located, near all bases and downtown. Well maintained home with an entertaining rear yard. Patios, gas fire pit & a covered Pergola. Well planned Granite and Stainless Kitchen. Dining room right there. Large Family Room, Cubby open under the stairs with a desk. Laundry and out to the two car side load garage. Three nice bedrooms and bonus room upstairs. Master suite is all you could ask for. Terrific location in the City of BeaufortGÇÖs Historic District. Walk to everything, coffee shop, restaurants, library, art galleries, Waterfront park, and USCGÇÖs Performing Arts Center. Three bedrooms and two full bath townhouse with new windows and new working shutters. At time of listing, only home on market in Battery Point with 4 Bedrooms, water views across the street, AND a 2-car garage now all for under $300k! And only one of two properties on the market in Battery Point with a lot size of .19 acres! Water views from front porch. Includes buyers must-have features including storage, fenced-in yard, plenty of parking, moisture barrier and spray foam insulation in crawl, raised HVACs installed 2010, fireplace, new Quartz countertops and backsplash in kitchen, new wainscoting and interior paint. The master! Large flex room welcomes you into the cathedral-ceiling master and makes the master feel private. Calling all investors! Great rental property. HUGE lot and 2BR home in the highly desirable neighborhood of Pigeon Point, in Beaufort, SC. Just steps away from Basil Green recreational park, playground, & Cuthbert waterfront park. Walk or ride bike to Pigeon Point boat landing and dock, and downtown shops and restaurants. Are you ready to own a piece of the lowcountry? Minutes from everything that Beaufort has to offer; shopping, restaurants, downtown, and the waterfront park. This lot is centrally located in a community with no HOA fees. This .32 acre lot is nicely shaded and ready for you to build your lowcountry home. This beautiful interior home site is a wonderful opportunity to build your dream home. Located on a cul-de-sac in a wonderful community that is nestled on the shores of Battery Creek. Enjoy wonderful amenities which include a clubhouse, pool, tennis courts, playground and community dock.